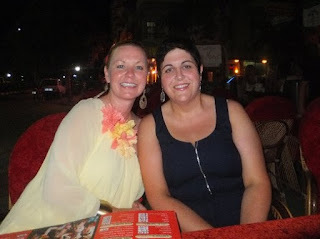 There are pluses and minuses to being single. There is no one depending on you to cook a dinner, so you can basically come and go as you please. I found myself in this quandary last week. I came out of school and decided that I wasn’t in the mood for going home. 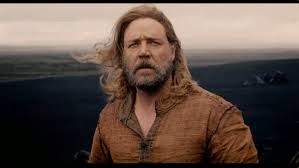 After a quick phone call to Mullingar cinema, I decided that I would go to see the early showing of Noah. Anyone who knows me knows that I am a HUGE Russell Crowe fan. He can do no wrong in my eyes. Okay, okay, his singing was a bit suspect in Les Mis, but he gave a brilliant portrayal of Javert. So it was that I found myself in a near empty cinema theatre at 4.00pm, munching my way through a family sized packet of M and M’s! I really enjoyed Noah, once I managed to buy into the whole Rock Transformer things that were helping him to build the ark. The real power of a film is if it gets you thinking. It certainly did that. I came out of the room feeling very depressed. I was thinking that it would have been better for Earth if Noah had allowed mankind to die out with his family. After all, it is mankind who is exploiting its natural resources. Animals are the ones who are still living in harmony with their environment, as it was intended. At the end of the film, Noah said that mankind would make a better fist of it this time. WELL, CRASH AND BURN THERE, NOAH. So it was that I was very down as I stepped outside. Two things stopped me in my tracks. 11) I had to scrunch up my eyes at the unexpected brightness. It’s usually pitch dark as I exit a cinema. 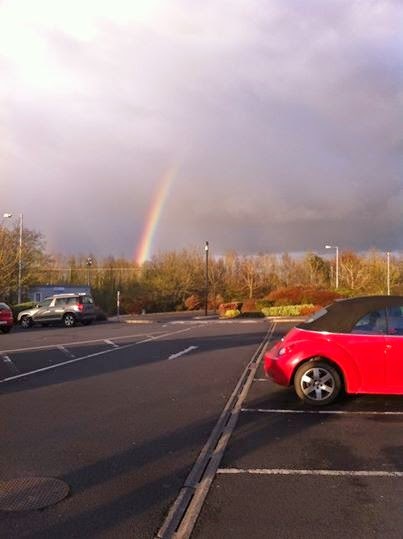 22) There was Roxy, parked up in an almost deserted car park, ensconced in ….a rainbow! Now, I’m no bible-basher but I have read enough Old Testament stories to know that God is said to have set a bow in the sky after the floods as a sign of His love for mankind and that He would never send the floods again.